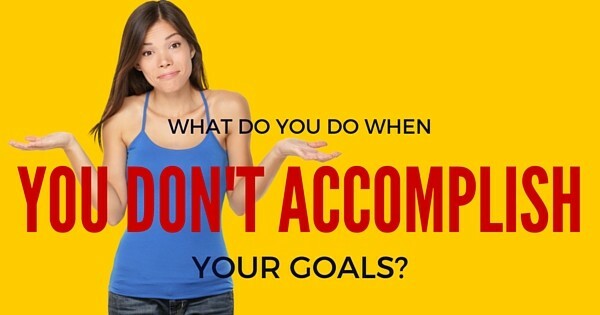 Mom, What Do We Do When We Don’t Accomplish Our Goals? But, what if there was a way to learn from NOT accomplishing our goals, so we have more probabilities of accomplishing them next time? Well, that’s what happened when I set a goal and DIDN’T accomplish it last year. I had a very compelling goal of having a sick pack. I even created a blog post to hold myself accountable to accomplishing it. It turns out, I totally missed the mark and it’s now been almost a year and I still don’t have my six pack! Great goals require strong and specific accountability. Strategy- Although my goal was achievable, I was lacking the sustainable strategy to make it happen. I didn’t have a definite meal plan and I wasn’t preparing my meals ahead of time to improvise for mishaps. I also didn’t have a strategy for when I traveled. Lacking a strategy caused me to miss my goal and lose the momentum I started with. We need a THINKING strategy and a DOING strategy. What are our thoughts going to be like and what are the best actions to support our goal (based on who you are and how you live)? Understanding these components will make sure that with the right strategy you will be closer to accomplishing your goals. Your goals are important, because they are the manifestation of who you are and the growth you are having. Accountability- In order to accomplish our goals, we need the right kind of accountability. Sometimes telling someone that you have a goal is not enough. The majority of times we need a community and/or a mentor to support us through our goals. Last year, I was “alone” in my goal. Although I had shared that goal with you, I did not encourage you to join me. Rather, I went solo and lost momentum. I also didn’t have a specific mentor for that specific goal. Great goals require strong and specific accountability. I had neither and that is why it didn’t work. Try to evaluate what kind of accountability you’ve had and what kind of accountability you could benefit from. Remember, not all accountability is created equal. With that said, you now know what needs to happen to accomplish those amazing goals in your life. Be it fitness, parenting, marriage, business, your goals are important, because they are the manifestation of who you are and of the growth you are having. Evaluate what needs work in your life and set an achievable outcome with the right STRATEGY and ACCOUNTABILITY. Share it below and keep me posted. I love you! Do you have family goals you are ready to accomplish? Woohoo! Let's talk.